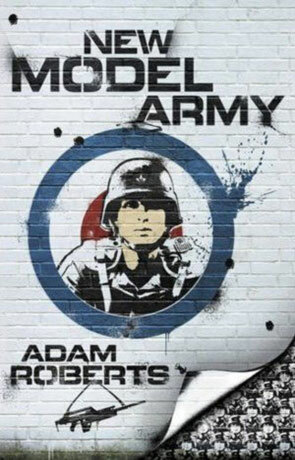 New Model Army is a science fiction novel by Adam Roberts. Pantegral is a giant, a democratic gestalt entity whose thoughts are populated from the thousands of minds that make up a New Model Army, it's intelligence is born from the almost limitless knowledge available on the internet. Stalking through the fields and towns of south west England he has brought war to the country, he cannot be stopped, cannot be beaten and lives for conflict. Narrated in the first person by Tony Block (who may be considered an unreliable narrator) New Model Army tell's the intriguing tale of a future Britain where many of the general populous have become dissilusioned by the thin veil of "democracy" and have risen up to join a new form of army, one that speaks of a true democracy where everyone has an equal place and vote on all decisions. "We don't have a democracy, in the world of politics today; we have an oligarchy punctuated by occasional contests to determine who has the most effective control of the media"
- sound familiar at all? The fact that the novel is set within blighty makes the message all the more personal (I even recognised a few places in the book). This new form of army works well thanks to advances in technology, although the theory is quite ancient. It's a very clever idea and something that does appear to be researched at the moment. The American's have a term for this - Network Centric Warfare and even admit that it would allow for new forms of organisational behavior. The NMA we follow in the novel is hired to war with British forces who still adhere to strict and unflexing methods and as such are hopelessly outclassed by a group that has a hive mind mentality, are completely automatous and have a much clearer view of the battlefield. This kind of organisation does rely completely on technology and communication though, a decidedly weak point and one that would need redundant fail safes to be used effectively. I must admit that I found myself liking this book more that I thought I would, I wasn't really impressed with Salt when I read it years ago and haven't read any of Adam Roberts work since but in hindsight it may have just been the wrong time for me to read it and may go back and revisit when time permits. I loved this novel, from the effortless intelligence that allows the easy reading of the novel's fairly serious subjects, to the clear and engaging action sequences and the clever use of current and near future technology, highly recommended. Written on 21st March 2011 by Ant.